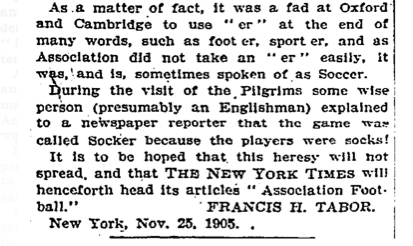 It seems a thousand pities that in reporting Association football matches The New York Times, in company with all the other newspapers, should persistently call the game “socker.” In the first place, there is no such word, and in the second place, it is an exceedingly ugly and undignified one. There was a reason why the nickname, however it was spelled, was so appealing in America. This was the precise moment that a very different game we called “football” was rapidly gaining popularity. Lyall documents how the Times went back and forth between “socker” and “soccer” for about a decade, finally settling on the latter in about 1914. Citing an academic paper, Lyall writes that over in Britain, “soccer” continued to be used “happily — right alongside ‘football”’— until at least the 1970s, when a surge of bad temper and anti-Americanism made it virtually radioactive.” She mentions the autobiography of Matt Busby, the manager of Manchester United in the 1950s and 1960s, Soccer at the Top, and another book of the period, George Best: The Inside Story of Soccer’s Super-Star. Rugby, under this system, had been shortened to “rugger,” a term that is still widely used. Even today, English people sometimes call football “footie,” but that is another issue. This from Stephen Fry’s hilarious, brilliant (yes, I know) 1997 book ‘Moab is my Washpot’ p199. I think we can be fairly sure however, that ekker, the word used at Uppingham for games, derived from ‘exercise’. ‘Wagger’ or wagger-pagger-bagger, which was used to denote ‘waste-paper basket’, is an example of that strange argot prevalent in the 1920s and 1930s that caused the Prince of Wales to be known as the Pragger-Wagger. Even today, in the giddy world of High Anglicanism in such temples of bells, smells and cotters as St Mary’s Bourne Street, SW3, I have heard with my own two ears Holy Communion referred to by pert, campy priests as ‘haggers-commaggers’ and my mother still describes the agony and torture of anything from toothache to an annoying traffic jam as ‘aggers and torters’. I’m sure I’m not the first to mention it, and I don’t want to belabour (belabor?) the point, but there’s no such newspaper called “The Times of London” or “The London Times”. It’s simply “The Times”, and has been since 1788. Now perhaps I can get back to watching the “soccer” World Cup? “of London” was not given as part of the name but merely as a description. Still, I think that highlights a difference in how we view newspapers in the UK and the model in the US. To me, saying The Times is a London newspaper would suggest it only carries stories about London. A local newspaper for local people, as the League of Gentlemen would say. A bit like the freebie newspaper we used to have here in Guildford which had front page headlines on how a chip fryer had caught fire and that a person broke their leg after slipping on the local ice rink. The Times may have its offices in London (and I see that it is printed also on Merseyside and in Glasgow) but it is a national newspaper. So it should really be referred to as a UK newspaper, not a London one. Hi. While totally unphased that our national game since the stone age (apparently) has always been called football rather than soccer, may I suggest that what irritates yer avridge Brit is the its somewhat patronising pronunciation by US commentators as something resembling “sucker” or even “succour”! And perhaps it has more to do with the lightweight gravitas, apparent certitude and profundity of delivery of their ever so crass and banal comments. I suggest that’s what gets up the hooter of yer avridge Brit. Signor Szymanski obviously has too little to occupy his days at Michigan U (hateful expression). Perhaps he should mug up on his basic etymology, having read at the top of p4 page, “the data reveals”. Now cyberspace is giggly at his confusion – as only a “datum” may reveal. Meanwhile most Brits I know have completely switched off from gridiron since a mild flirtation in the early 80s, owing to the tedious nature and lack of flow, apparent even on UK broadcasts with only 25% of the commercial breaks. Herne Bay woman dies in nuclear holocaust. Part of the problem in the UK with “soccer” is class, still an important factor here. Soccer is perceived to be an upper class term originating in the public schools and Oxbridge. The Open University use to show their lecture programmes on the BBC and I caught one many years ago on the rise of organised sports among the working classes. Both Association and Rugby football started out being codified in the universities and public schools. I recall that for the first few years, the winners of the FA Cup were all associated with with these institutions. But sometime in the latter half of the nineteenth century, Association football was taken up by the working men’s club movement and became a working-class sport. Rugby, on the other hand, was still perceived as upper class. (I’m not sure if that applied to Rugby League in the north of England.) There’s an old joke that goes, football is a gentleman’s sport played by hooligans, and rugby is a hooligan’s sport played by gentlemen. Indeed, when the BBC television programme on the origin of words, Balderdash and Piffle, investigated the origins of “soccer”, the comedian guest presenter said the reason he hated the word was because it was posh. Incidentally, this Briton still enjoys American football, and went to both NFL games at Wembley last year (as did rather a lot of other people), but last went to an Association football game in 1966, the last time the World cup was held here. The stratification of football and rugby union may be true as far as England (and possibly Scotland) are concerned but here in Wales rugby is enjoyed and watched by all classes of person – female as well as male! It should be noted that the American football code, as played in the 19th and very early 20th century was much more like rugby than it was like current American football (sometimes called gridiron in England). It started mutating into what it is now in 1908, with the introduction of the forward pass, and has kept on mutating at a rapid pace since. Actually both rugby codes (rugby league and rugby union) have adopted some of the American innovations, such as awarding points for a try (what’s called a touchdown in American football). In the 19th century in both rugby and American football, the kicked extra point was the only score you got. Rugby’s terminology “try” still reflects that. Attaining a try gave you a chance to kick for a point. If I might add several more layers of confusion: “soccer” is a common term for association football in areas of Britain where the various forms of rugby are more prevalent, such as south Wales (rugby union) and parts of the north of England (rugby league). I went to high school in Canada and in archive copies of the school yearbook from the 1910s I saw “rugby” being applied to Canadian football (which is closer to the game they play in the NFL than to any modern rugby code). And “footy” is a common term for Australian rules football, which is another game entirely, although probably closer to rugby than to any other code. Australian rules football is closer to Gaelic football than it is to rugby. It’s close enough that professional Australian teams have done profitable tours of Ireland playing a compromise rule-set between Aussie rules and Gaelic football against Irish county sides. or as we call them in Queensland, ‘that game the posh people play but few poeple watch’ and ‘aerial ping-pong’. I have been closely following the World Series Of Soccerball in Brazil. Fascinating stuff and I think it may catch on. It is another issue, in which I dispute the word “still”; “footie” is not a holdout from prewar school slang, but a recent import from Australia (where it may refer to any of four varieties of “football”) reflecting Australian English’s fondness for -ie diminutives (rivalled only by -o diminutives). How recent do you mean by recent? I’m sure “footie” was used at my grammar school in the north of England back in the sixties. “Footie” in Australia refers to Rugby League (in Queensland and New South Wales) or to Australia Rules football (everywhere else), but I have never heard it used to refer to any other football code. Soccer, in particular, is “soccer”, or sometimes “the round ball game”, except to its own governing federation which calls it “football”. And Rugby Union is simply “rugby”. I recently read some of P.G. Wodehouse’s schoolboy stories (ca. 1905), and was puzzled by descriptions of the game they called “footer.” Knowing none of the wonderful sports history I’ve learned in these comments (thanks to all! ), I assumed “footer” meant soccer, and only gradually came to an awareness that it must refer to rugby (or “rugger”). Many teams in MLS use the term football in their name, New York City Football Club for example. An alternative name for the NFL sport could be NAOball, which means North American Oval ball. In the UK, rugger is used as a way of referring to the rugby union (15 person) version of rugby, but would not normally used to describe rugby league (the 13-person version). In respect of the latter, followers would used rugger derogatively to refer the rugby union version an elitist sport.